Though much of the information I cover here is not as "magical" as you may like, I consider these rules to be the basics with regard to weight gain. These are not all of the answers, but they are definite elements that MUST be addressed in any successful weight gain program. If you were to drive cross country to another city, would you just start driving randomly, or would you plan a route that would get you quickly and efficiently? Think of your plan as a road map and your goal as your destination. Without a plan and a specific goal you will be without focus and can easily get lost or side tracked. This happens more often than you know. I see many people in the gym just doing whatever, or just eating whatever -- no plan or specific goal. They wonder why they don't make progress. They have no focus. 4. Stop listening to every ridiculous piece of advice you hear in the gym. The person giving the advice was quite confident about his recommendations, and he had an impressive physique that typically elevates him to the elusive "listen to me if you want to look like me" level in the gym. He was bigger than my client, so even though my client's "intellectual" mind knows that that advice is absurd; his "unrealistic dreamer" mind took this information very seriously. So seriously that he changed his program and didn't inform me until a week or so later. This particular person had been making great progress on his current program, yet he allowed this one person’s comment to overshadow that progress and convince him that his program was inadequate. This is a mistake and it showed in his lack of further progress. In addition, don't judge the validity of what a person says by how they look. Just because the guy is huge doesn't mean he is spewing pertinent advice for you. Many people that have big physiques are big despite of their training, not because of it. I know some huge guys that know very little about training and dieting correctly. They can do whatever and still gain muscle; unfortunately we are not that way, so we much approach things in a more intelligent way. Honestly, I do not do any aerobic activity when I am trying to gain weight. This is mainly because it interferes with the important “non-active” time my body needs for muscle building and recovery. I do understand that people have lives and other activities that they don't want to give up, so it must be kept to a minimum. It won’t hurt your progress as long as you don’t over do it. If you find that you are doing more aerobic activity weight training, that’s overdoing it. I call these people, “program hoppers”. They are very enthusiastic when starting a new program, but they never follow it long enough to actually see any results. They are easily distracted and love to drop whatever they may be doing to follow the latest "hot" workout or exercise. This rule is pretty simple, but usually the one that is not done correctly. If weight gain is your goal, then you will need to eat more food. Period. In most cases, you will need to eat more than you are normally accustomed to. One large problem that I had when starting out is I just had no appetite. I knew I needed to eat more, but I just did not want to. I had to force myself to eat at each meal. Thankfully, after about 2 weeks, my appetite grew. I was becoming hungry before each meal, and if I didn't eat my meal at the normal time, my body knew it. If you have this problem, you still must eat something, no matter how much. Start off making yourself eat something small like fruit every few hours. Then, as your appetite becomes more active, gradually move into more real food. What this will do is gradually get your body accustomed eating at regular intervals. Eventually you will be hungry before each meal time. When eating more, you will need to make sure that you are getting plenty of good quality protein. Protein is a nutrient that is essential for building muscle. Every meal that you eat should contain some form of protein. Meal Replacement Powders like Myoplex are excellent for this purpose. 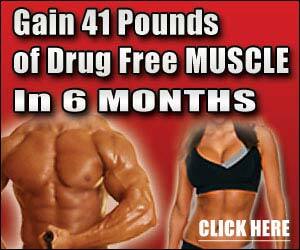 They enable you to eat large amounts of good quality protein in a very convenient manner. In addition to eating more calories, you should also strive to eat more often throughout the day. Eating infrequently, or going long periods without eating, will cause your body to breakdown muscle tissue for the calories it needs. This is especially true for those with fast metabolisms. Spreading your meals throughout the day will give you more manageable meal sizes, improve nutrient assimilation, and make sure that your body always has the calories it needs for muscle building and repair. I recommend eating a high protein meal every 3 hours. During normal waking hours, that usually equals about 6 meals. Now, I know what you are saying, “I’m too busy to do this”, or “how can I do that with a full time job and school?” Don’t let the thought of this being too difficult keep you from doing it. It may seem very inconvenient at first, but once you get in the habit of doing it, it becomes second nature and you don’t have to give it much thought. Trust me, I’ve been doing it for years and do not feel that it’s limiting or time consuming. Before you buy any product, remember that supplements are not magic. Too many people think that just because you buy the latest product, it guarantees that you will automatically begin to pack on the pounds. The truth is that supplements are only there to enhance an already solid diet and workout program. Adding More Convenience: Using food supplements like Myoplex or Designer Protein help to eliminate the common problem of 'not enough time', by providing you with a quick, efficient way to get your required nutrients each day. They make eating large amounts of calories and protein easier for people with low appetites. Increasing Strength Levels: Products that contain Creatine, like Phosphagen HP or Cell-Tech enable you to swing the odds of gaining more weight in your favor by increasing your strength output. Creatine enables you to lift heavier weights, which will stimulate more muscle fibers and cause more muscle growth. Decreasing Recovery Time: Vitamin C is essential to prevent free radical damage, which is accelerated after the heavy trauma of weight training. It is also essential is helping to repair connective tissue. All of this helps decrease the amount of time you are sore. Enhancing Your Immune System: Weight training increases the body's need for many minerals like magnesium and selenium. I always use a good multi-vitamin ensures that I am not deficient in any major essential vitamin or mineral. Deficiency symptoms include muscle weakness and suppression of the immune system, muscle cramping and fatigue. Yes, but I have to be honest and say that from my experience, gaining weight is much more difficult than losing fat. Even if you are doing everything right, it will still be difficult because you are fighting against what your body naturally prefers. If you are naturally thin, building an impressive physique involves persistence and determination, but no matter what anyone says, it is well within your ability. Good luck and for more information on how to gain weight, be sure to check out my website here.